Today we get to play with our dishes again thanks to Susan @ Between Naps On The Porch. 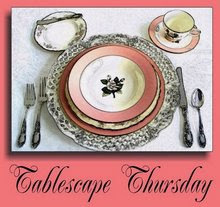 She always shows us the most amazing tablescapes and you'll also find a list of all the other participants. Be sure to check out her blog for tons of inspiration and eye candy. Even a simple cake and coffee gathering can be pretty and made to look a little special. Everyday dishes, these are the famous Big Lots dishes, can be dressed up with a little lace, silver, flowers and a beautiful cake plate. A little tip for your flower arrangements. This is the backside of my Dining Room arrangement. It is fairly plain, so just a few colored stems to compliment the cake plate makes it look special and are easily removed when dessert is over. This is the side that you see the most of on my table. Since some of the more prominent flowers are quite expensive, I chose to display them from the side that is seen the most. That allows me to save a ton of money and still have an arrangement that can change with just a few additions or substractions. This is by far my most favorite cake plate. I won this in a giveaway that Laurie @ Bargain Hunting and Chatting with Laurie had last fall. I just love the beautiful colors and the gorgeous flowers on this cake plate. Laurie also has the most fabulous blog. If you don't know her, then you have missed a ton. She has gorgeous things and displays them beautifully. You really should visit her blog. It also has the most wonderful cake server. I have used this cake plate constantly since I won it, I just don't think I've shown it to you in a tablescape. 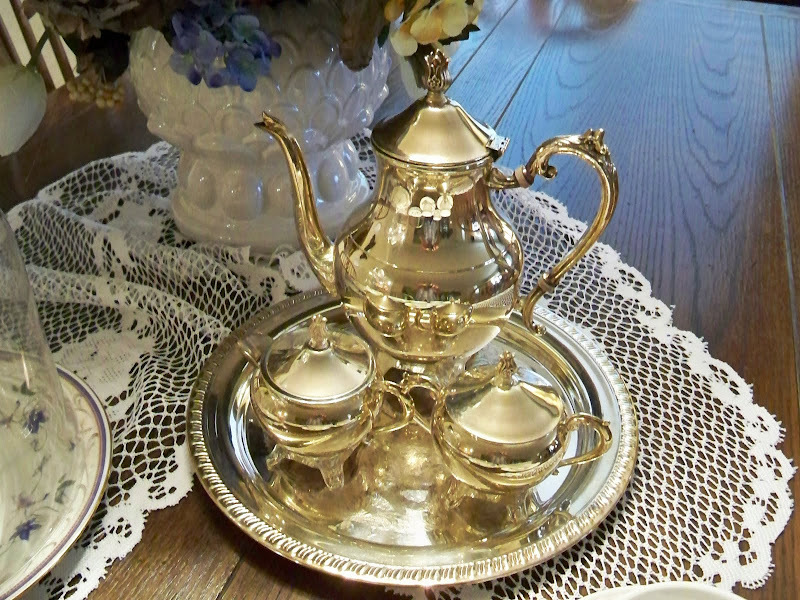 My silver coffee service is one that I have had for many, many years. It is very simple, but I love the curvy lines of it. It makes the coffee seem special. 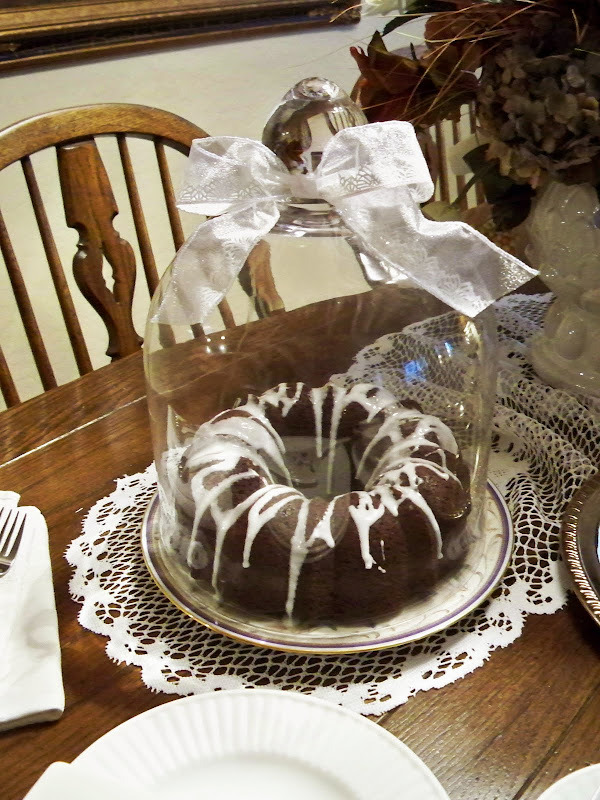 A simple bundt cake with a drizzle of frosting looks so much more gourmet under the cloche and served on a lovely cake plate. Dessert is ready. Won't you join me for a piece of cake and a cup of coffee? Pull out those special cake plates and your silver and use it. It really does make the simpliest of tables seem so special. Thanks so much for stopping by, I really do appreciate your visits. Marty I LOVE your dishes (wish we had a Big Lots in Canada) you can not go wrong with a pretty white set. 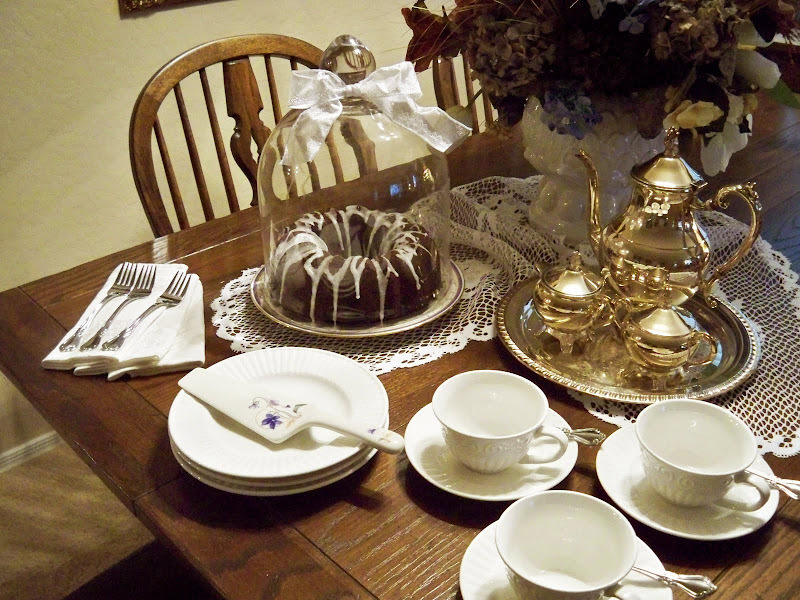 Your cake plate and tea set our BEAUTIFUL.......not to mention how delish the cake looks....YUM! Oh Marty, this is lovely. The only problem with blog land is that we really don't get to stop by and enjoy that cup of coffee (usually). Looking forward to your Cloche party. I'd love to get a big one but don't see them in Home Goods or TJ Maxx anymore. Catalogs seem expensive. Any suggestions? How beautiful is the flower arrangement, I love the cloche witht he bundt cake underneath it. So beautiful. Laurie is just the sweetest there is. What a wonderful treasure you won. I love the delicate flowers and the blue color is so serene. I love it. 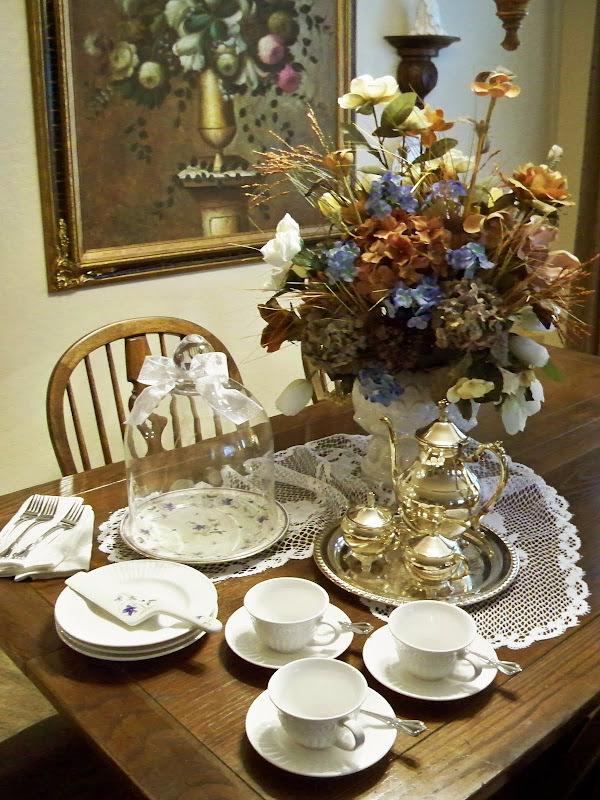 Your silver coffee service is absolutely exquisite. I love it Marty. How devine. Can't wait for the next cloche party. I always have so much fun. Thank you for hosting this for us Marty. It allows our creative juices to flow. Marty, Everything is just beautiful! I love it all and I can't wait until the Cloche Party. Your silver set is gorgeous! The table decoratuons even for a simple cake and tea day is so sweet!!!! I love that idea of the cloche for the cake plate!!! Fits perfectly!!!! Ceekay would like to see Snow, I suggested we get a group of ladies and drive to Prescott for the day!!!! Have lunch, shop those darling antique shops and go see/play in the snow!!!! Hi Marty, a lovely setting for coffee and cake. I LOVE the coffee set. I too have looked at Cloche's and here in the UK and they are quite expensive. I have ordered a glass cake cover and am waiting for it to be delivered. Not sure that it will be as good as it isn't very high! !Also I am not too creative but I will try!! Thank you for the virtual coffee and cake. And what time shall I stop by? :) Lovely, lovely, lovely! Thanks for the tip on the flower arranging. That will help me out with my table that has the kitchen on one side and living room on the other. Marty I love all of your tablescapes, but I am smitten with that oil painting in the background! Beautiful tablesetting Marty. I do love those dishes and we don't have a Big Lots here either. Your arrangement is lovely too and oh my, that cake. YUM!!! It is all just beautiful! That chocolate cake looks worth the calories. I say----it's my Vitamin C! 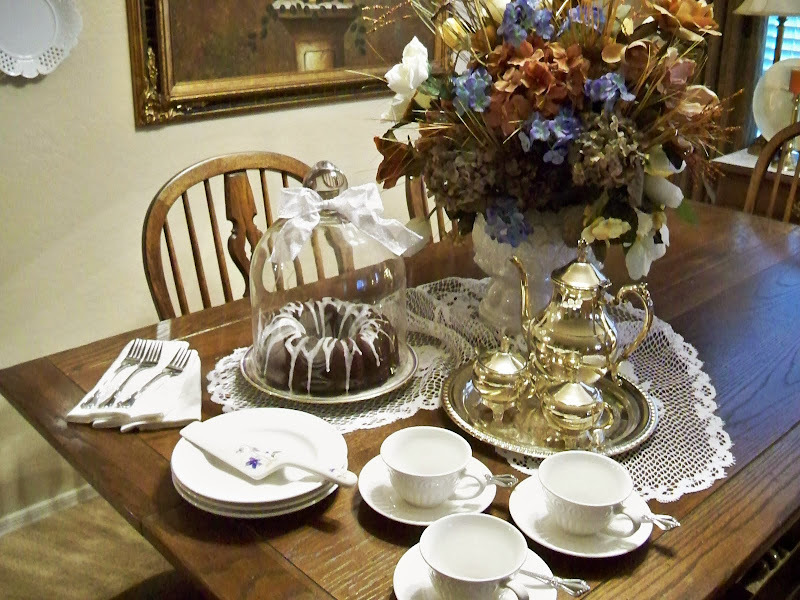 Cake and tea, So inviting. The purple flower detail is beautiful. Everything is beautiful. I can certainly see why you love the cake plate. I hae a giveaway on my blog today...check it out! Yummm...Your tablescape for dessert is beautiful. We have the same tea service!! I love mine too! You will see it soon!! Happy TT!! Your cake looks delicious!!! Everything is so elegant. That looks so inviting! I'd love to sit right down and have a cuppa and a piece of that delicious looking cake. I am seeing that cloches have many uses and I want one bad but the large ones in our town are really expensive. Great tips on making your floral arrangements do double duty too! Very appealing and pretty. You have a lovely table and yummy dessert. Please come by and visit me at HomeHaven anytime. The lace made me hold my breath I just love lace. I've got it all over the house. Sweet little violet plate too. So pretty. I love Big Lots. My sister got her granddaughter the cutest chair to sit by her dads chair there. It is a small recliner just like his big one. So cute. Simply gorgeous. The flower arrangement is stunning and I adore that cake plate and server. Marty, this is so pretty. I often forget how lovely the cups and saucers are to this set because we don't display them often, do we? It is just charming. Save me a piece of that delicious looking cake. Marty, what an exquisite way to serve coffee and cake. Everything is so beautifully presented. Your table looks beautiful and I adore that little violet cake plate and server! Hi Marty! Oh, your cake and coffee setting is so lovely! Your cake plate and server are beautiful and I remember when you won it! I wasn't jealous a bit! LOL Now your cake looks good enough to eat. Love your pretty silver too! You always make such lovely settings. Sooo pretty Marty, love the siver and white together. That is such a pretty cake plate and I will have to say the cake makes it even look better. Anyone having coffee and cake with you would have to feel spaecial. Thanks for stopping by. Now aren't you the clever one Marty with your double duty floral arrangement! I love your cake plate and I remember when you won it....is it ok that I'm a teensie bit jealous? That's OK -- I'll just come over and have some of that yummy cake and a cup of coffee...that will make me feel better. Thanks for your sweet visit. Marty, This is fabulous! 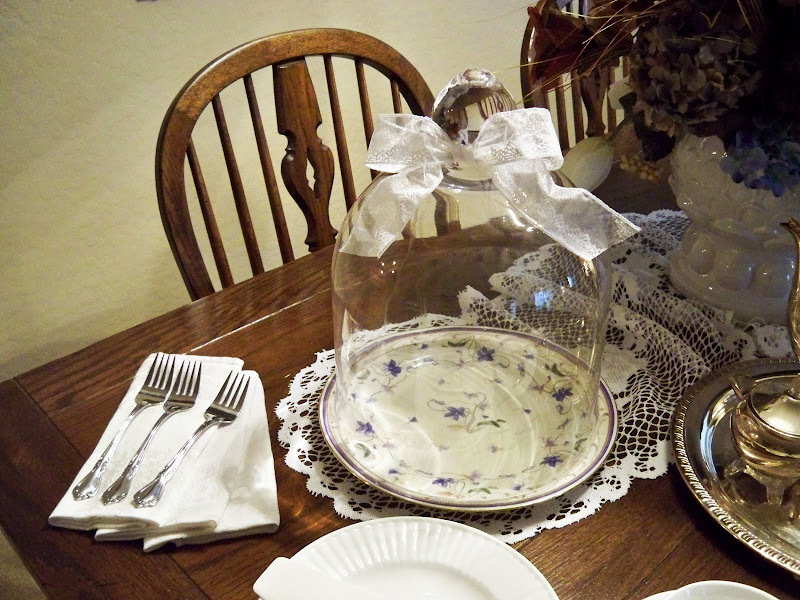 I never would have thought to use the cloche top for the cake plate and I love that idea. Your cake plate is so pretty too! Can I please, please come over for coffee? This looks absolutely beautiful. You are inspiring. I have pretty things, but I get stuck in using the same old, same old. Thank you for the incentive to get out some of my nice things and actually use them! I think it is always fun to use "the good stuff"! Very nice Marty! Love that cake plate! Just beautiful! I love the touches of blue, and the lace! Great idea to use a cloche over the cake plate! You table for coffee and dessert looks so inviting! Eveything is so pretty. And I couldn't agree more with using all your pretty things. Life is just too short. Love your cake plate and server. I, too, was a lucky winner of the lovely Laurie and received a stunning cake plate and server. Like you said, I am constantly using it but, I think I better use do a tablescape with it so everyone else can see it! Love the tablescape! I would love to stop by and have some of that delicious looking chocolate cake on that gorgeous cake plate! Your cake plate and server are just beautiful. Lovely tablescape. Thank you for sharing. Marty-The Gibson plates are getting a work out this week! They are all over the place :) I recognized the cake plate and server from Laurie immediately-I love the violets on it. Your cake looks wonderful. I hope you really did have guests to enjoy this beautiful table and dessert! Marty, a quick hello and love the cake plate. Just haven't had time to post or visit much, maybe this weekend I can get some post together for next week. How pretty, Marty! I love the cake plate and server. I am regretting more and more the white dishes I passed up at Goodwill this past weekend. Yours look so nice. I'll be right over for a slice of that yummy looking cake. Your plate and server look lovely. Have a great day! I'll be right over! What a wonderful table! 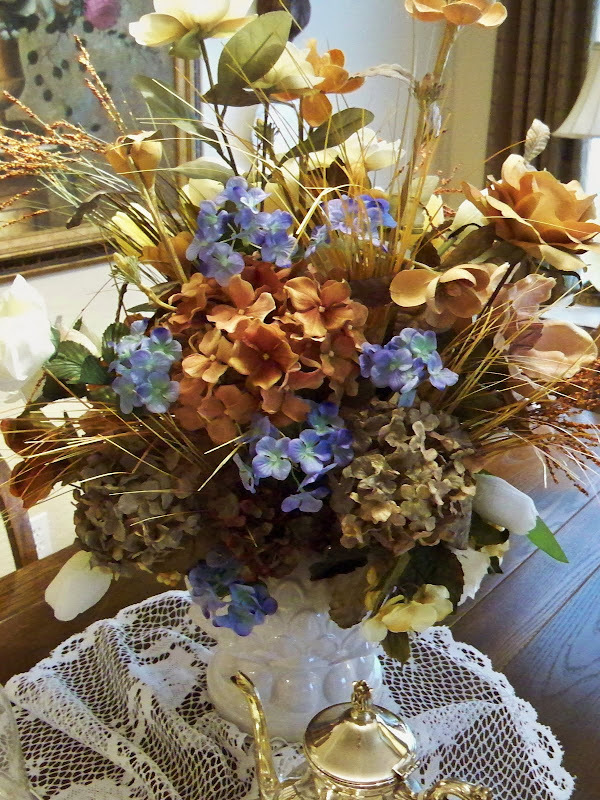 The center piece idea is a very thrifty solution as well as beautiful! Love it! Looks good to me, pretty cake server set! My, ohhh my...what a lovely tea you have set, my friend! I am sooo ready for an afternoon tea break too! Hehe! Of course, you had to know that I was seriously drooling (sorry that's crude) over your beautifully polished and sparkly tea set! It's gorgeous!!! Ohhh...and I love that pretty violet cake plate and server! 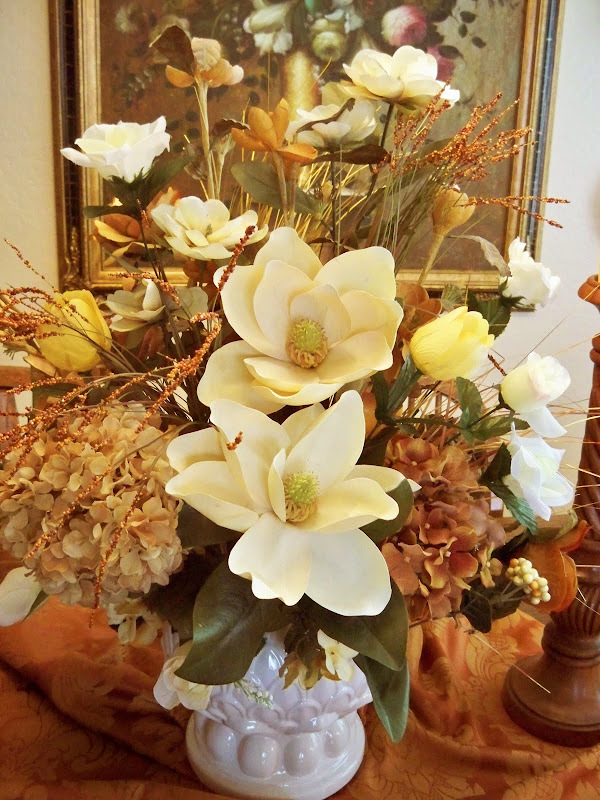 I remember when Laurie was doing that giveaway...it looks fabulous on your table, Darlin'! Marty, you always...always make the most gorgeous floral arrangements! I just stand in awe, my friend! Oh yes, I will have a piece of that yummy looking cake with my tea, please! Thank you so much for having us today...this has been a treat, indeed!!! MARTY!!! :) This is utterly delightful and yes, you are right: you can have something simple AND elegant. I think God gave us the beautiful things of this world as a glimpse of the amazing splendor to come in Heaven and we are to be joyful for every single moment of beauty. With 3 kids (and two of them small--Thomas just turned 4 and Kate is 6) I can't always cook a huge feast for a bunch of people, but I CAN have friends over for a playdate and I always try to serve the grownups the nice china--or my Big Lots china (which is still VERY NICE even though I got a great deal). I couldn't find the exact Gollum pattern, but found something beautiful nonetheless. Your table, as always, is beautiful. 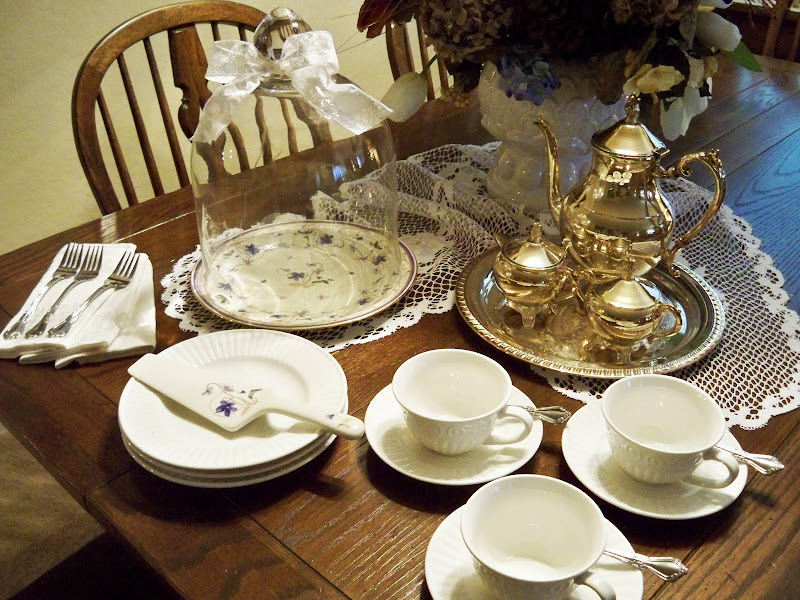 I am asking dear Husband for a real silver tea service for my birthday (used, of course, so we can find one we can actually afford--maybe Ebay or a yardsale) and yours is delightful! Very pretty setting for serving dessert. I love the cloche for keeping the cake moist. I LOVE that cake plate!! Marty, beautiful cake and coffee table...simple but very elegant. 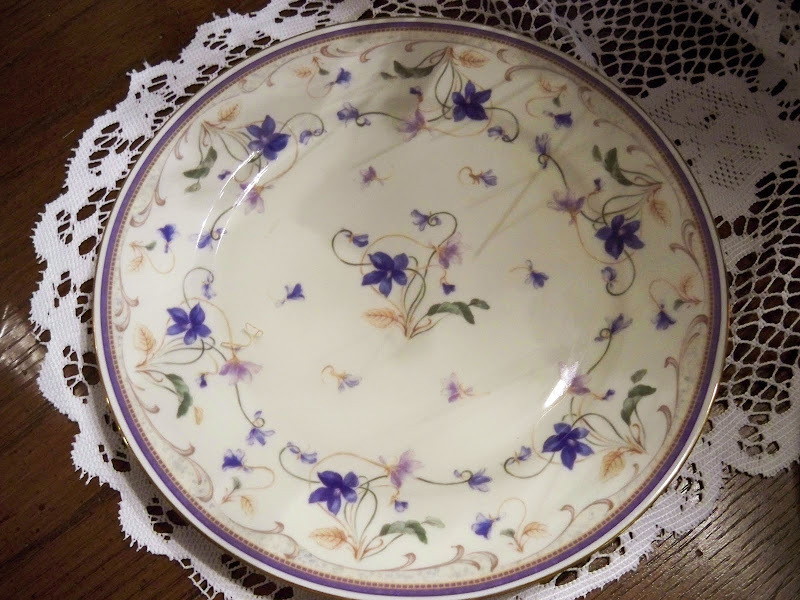 I think my favorite would have to be that gorgeous violet cake plate, so pretty. Thank you for sharing. Very nice tablescape. The cake looks yummy! Marty, I fear someone has hacked into your email account at gmail, as I got a very strange email from you this morning! How are you doing? I hope all is well with you. I know this might be a surprise to you but I'm writing this email to you in an hurry and in a confused state of mind. I want to say I'm really sorry that I didn't inform you about my traveling to Scotland for a Seminar. It was something urgent and i didn't even inform anyone about this traveling. But I just got myself in serious mess here. I got my wallet misplaced on my way to the hotel and all my money, phone, bank cards, diary, my return ticket and other vital documents are all in the wallet. I'm so confused right now as I have lost all contacts. I need to get out of this mess. Please I need $1,500 USD to sort myself out and to pay for the hotel bills but I will appreciate any amount you could afford. I will pay you back as soon as I get back home. Let me know if you will be able to help me with any amount and you can help me send the money with my details below at any western union money transfer office and i will get the money over here within an hour. Kindly help me to make the transfer as soon as you receive this email and you should get back to me with the 10 Digit Money Transfer Control Number, exact Amount sent with details used in sending it. I still have my passport to prove my identity at Western union here when receiving the money, and I will email you with the return flight details immediately I receive the money. I've removed your last name but they had it spelled correctly! I hope you can find the culprit!!!!! I too received an email requesting me to send you money because your stranded in Scotland. It came from your gmail account. I love that cake plate! And I'd love a piece of that cake too! Thanks for stopping by my place. Your tablescape is so inviting. I love the cake plate...well, I love all of it. I am your newest follower! Anyway, I know it's going to be a fun event and interesting to see everyone's displays. I love that cake plate and server. And I get a lot of mileage out of my Big Lots dishes. They're so great to mix with other pieces. How beautiful Marty! 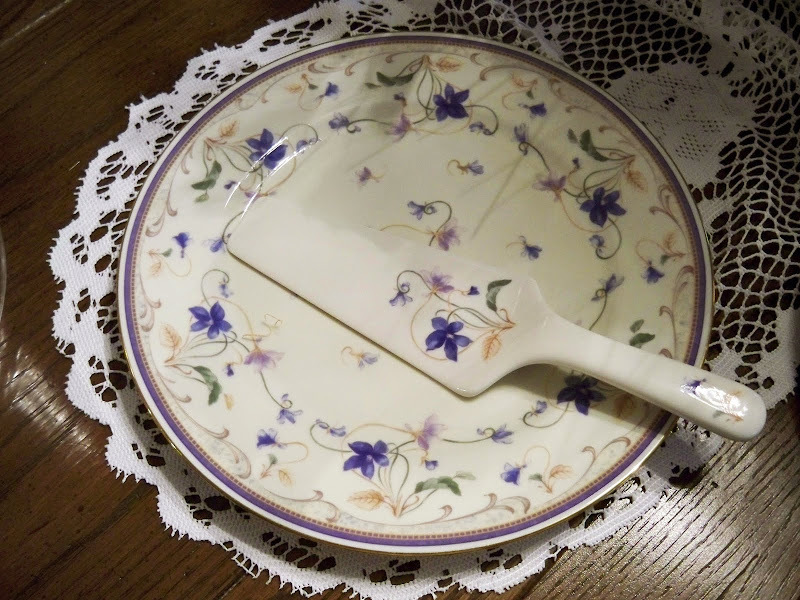 I adore that cake plate and server...are those violets? My Grandmother loved them so and they always remind me of her.